Room Design: this picture here depicts the Accenture office in Hamburg. 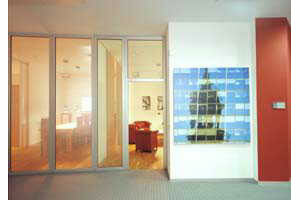 In 2001, Corinna Rosteck artistically devised a concept to visually connect the Accenture reception and waiting area with the meeting rooms. Photography marks the areas of communication between these areas. Abstract water reflections and reflections in building facades feature as a main image.